March 11, 2011, the Tohoku earthquake/tsunami hit Japan. Roads in the region were affected and traffic was put to a complete stop. 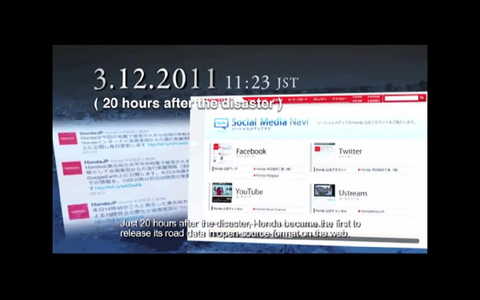 Within 20 hours after the earthquake, Honda quickly responded to the critical situation by providing road information collected real-time via the Internavi system installed on vehicles. By plotting these real-time data on a map, usable roads are visualized. Information was provided on the internet and through Google Map. Internavi became an indispensible tool for the nation. Furthermore, Honda exhibited this information about road repairs, which represents how Japan stood together and began to rebuild after the disaster.